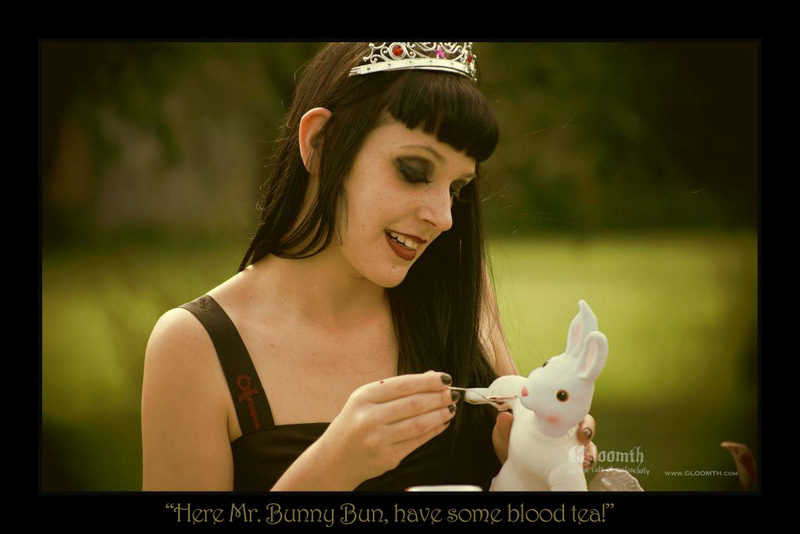 Perhaps you’ve noticed the slightly frightening white rabbit doll that appears in the majority of Gloomth photoshoots. From hovering like a ghost above Lady Rakasha to lazily reclining in the arms of Mouse, the Bunny is nearly as famous as our models themselves! However, all these years and the bunny has never had a name! He’s been called a lot of things, from Mr.Bunn to That-Gross-Tatty-White-Doll-Thing; but he has never had a real name of his very own. We will announce the top 3 names on the 23rd (Feb) and the voting round will go until the 1st of March on our Facebook. EXTENDING THE DEADLINE TO COMMENT WITH YOUR CHOICE OF NAME TIL FRIDAY THE 25TH!!!! HOW TO ENTER: Post a comment here with the *one* name you’d like the Rabbit to have! One entry per email address/person, and only one name suggestion per entry! Congrats!!!! Your name pick has made it to the final round of the contest! You can vote for it (and get your friends to) on our Official Facebook!!! I would name the bunny Maximus. I would call him Sir Ivory. Hi. My suggestion is “Sir/Ms. Ghostly”…depending if it’s a boy or a girl. Thank you for the contest! Hi. Id like to suggest “Sir/Ms. Ghostly”…depending if its a boy or a girl. Thanks. Sorry, I didn’t mean to over post, it said “not found” so I didn’t think it went through. He looks like a Byron to me! I declare he should be named Honeybun. Oh goodness how did i not see that comment right above mine, silly me. WELL, i also think that Christoph is a good name for such a cute rabbit. I would name him Sir Steven Ragtag, of the noble order of of fabric scraps (since there’s always someone who has to look after all those lovely choice bits of material left over after cutting *grin*). Bram the Bunny, or just Bram for short, would be splendid! “Hoppit” or perhaps “Sir Hoppit”. Princess Hareiette sounds lovely to me. Alexander, or Anastasia- depending on whether its a boy or a girl. As in, the six foot tall rabbit… pooka… thing from the Jimmy Stewart movie. Winkie Von Fluffyton the Third. Darque or Chaos for short. anyway i like chuckles comment better than marshmallow….. i thing cooties would be cute…yay cooties! Orran, The same name I gave the white rabbit that rann through my back yard, and now lives luxuriously in my basement. Yes I saw a white rabbit in my backyard, chased it, caught it, and kept it. Poor thing wouldn’t have survived another day in the wild, some one released him into the wild thinking he’d do fine, he was hungary and scared, now he is full grown and lazy. In short; Yes, I chased the white rabbit, and I cauf=ght him before I tumbled down the rabbit hole, His name is Orran, and Orran is my proposed name for the rabbit in the pictures. I’d like to sugest the name of Vorpal Bunny, as inspired by the Holy Grail. I’d call him Elric, after Elric of Melnibone. Mr. Thumper- Buns. Get it? Mwah ha!!! I’m liking the sound of Hatchet (or, “Hatchette” if you’d like a more feminine appeal). And I hope a proper name will coax him back into modelling. A bun as distinguished as he deserves proper titles. I dub him Lord Hoppington, Marquis de Sauter, First Bun to the Queen of Gloomthingdon. I must admit that “Maximus” made me giggle. He’s just such a quiet looking fellow, it would be adorable for him to have such a “butch” name. I think the bunny should be named Monocle. Lord Alabastian or Lady Alabastette. …But Looks more like a fell’a t’me. I’ve always had thing for donnie darko and in the movie donnie’s schizophrenia causes him to see a bunnie named Frank. I absolutely love this character and i think it would be fantastic if you named your little doll after this. Like everyone else here, I LLLLOOOOOVVVEE your clothes. How about naming the bunny-thing….hmm…what do you think of Crowley? After the occultist allistair crowley? I like something eligant but still kinda dark, so Evelyn’s good. Go with that. Bun E. Lumpkins………… or Dennis Hopper. I realy think Dorian is a geat name. its sophisticated, bold and dark. which contrasts the white of his coat. It looks to me like a classy victorian rabbit so how about something Shakespearean like Gertrude? Why not “General Woundwort”…..that fearless rabbit from “Watership Down”?! Why? I suggest we honor a grand original gloomth, someone who practically invented combining childlike (or childhood-related) images with slightly sinister overtones–that is, Lewis Carroll, the author of Alice’s Adventures in Wonderland & Through the Looking Glass. “Lutwidge” was his real middle name, and I’ve always thought it should be the name of the White Rabbit in Alice. His name: Charles Lutwidge Dodgson; “Lewis Carroll” is latinate translation of “Lutwidge Charles”.